Basic plant stands, about 2' tall start at $50 and increase in price depending upon size and design. Animals and birds are approximately $400. 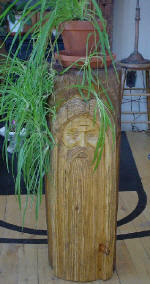 Larger carvings of characters start at $500 for figures and are between 5 and 6 feet tall. Figures of real people start at $600, increasing with complexity. Each carving is different, so these are only approximate prices. More precise estimates would be available as we discuss size and design. These price do not include HST. Canadian orders will be adjusted to include tax. Delivery in those counties bordering Annapolis County are free. Shipping costs are approximately $50 throughout the Maritimes. For destinations further a field, we would have to arrange special shipping with appropriate costs.